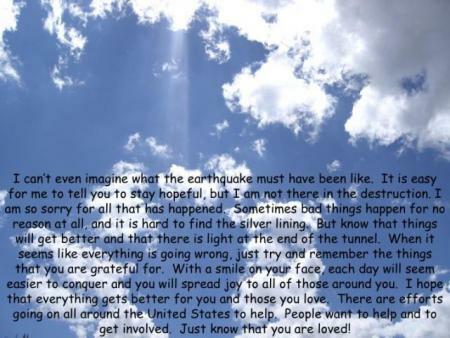 I know that times are hard, but I also know that hope will get you through the hardest of times. Keep hope! Hope that love will triumph, that peace will be restored, that hearts will mend. Lives have been lost and, like homes, dreams have been crushed. But your dreams for the future, for a life beyond tomorrow, can still be achieved. Life is not over, although it may feel like it. So many people want to help you and your country, so many people care for you and also have dreams for your future. Your pain will diminish. Your life will be renewed. Your country will be revived. It may be sometime before you see this take place around you, but know that it will. And know that when it does you will have a new beginning to embark upon. Hope for that new beginning, for those new dreams you will recognize. Love those around you and mourn together so that together you can grow stronger as a family. Find peace in your heart so that you may bring it about in your country. Hope, peace, and love will carry you through the pain as if on the wings of an angel. We love you and pray for you. May peace be with you always.